Most people loathe going to the doctor’s office. 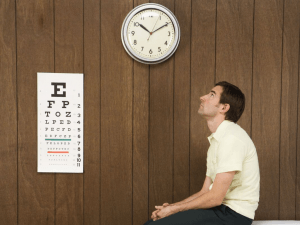 It takes time out of your busy schedule, waits can be annoyingly long, and there’s always the prospect of receiving disappointing or even frightening medical news. There are no two ways about it—a visit to your physician is typically a drag. As such, you don’t often find people at the top of their moods when it comes time for a checkup. Whether it’s going to the doctor, dentist, optometrist, or any other branch of healthcare services, patients take on less-than-desirable characteristics when they walk into the office. This can take the form of impatience with the process, haughtiness in self-diagnosis, or restraining anxiety. But, learning to quell these behaviors is part of being a medical professional, right? Knowing how to handle these situations correctly helps you retain a happy client base and keeps your practice running smoothly. And now with better technological advances in doctor-patient communication, you can provide a more personalized and convenient experience for your clients. And this digital revolution is good for your business, too. A study published in the Journal of Management Science found that the offering of “e-visits,” or being able to communicate with a doctor over the internet, caused in-person office visits to increase by 6 percent. So, providing a better line of communication keeps your customers happy and keeps your practice profitable. Below, we have outlined five different patient personas you have undoubtedly encountered. Then, we explain how employing a team of live chat agents for your medical practice can help you mitigate any clients issues. Let’s check it out. As a doctor, you’ve heard every excuse under the sun for late arrivals. “Traffic was horrible,” or “I was dropping my kids off at school,” each reason putting you further and further behind your schedule. A research team at Brock University found that 50 percent of all doctor’s appointments begin later than the scheduled time. But the doctors out there are not entirely vindicated from the root of this problem—a good number of late appointments are caused by a late doctor. However, one could sympathize that maybe it’s the late patients that tripped up the schedule. Which came first: the late doctor or the late patient? Without pointing fingers, a good way to remedy this issue is to run a tighter ship when it comes to scheduling. Over the years, the front office workers have taken the brunt of appointment-scheduling responsibility, along with tending to dozens of other clerical tasks. Your front office is the backbone to your practice and having your employees juggling all of these jobs can really throw a wrench into the works. With live chat functionality, you can give your patients the power to ping into an agent and schedule an appointment in seconds. While there is no foolproof remedy to keeping your appointments on track, if you pair a live chat offering with an automated email or text messaging service, you can do everything in your power to hold your clients accountable. According to the Journal of Participatory Medicine, self-diagnosis can be a two-way street of opinions for doctors. On the one hand, self-diagnosis can hurt the reputation of a doctor and undermine their authority as a healthcare professional. On the other, a patient who is self-diagnostic is likely more in tune with self-care and therefore more healthy. Self-diagnosis can have dangerous repercussions for both doctor and patient. Commercial drug offerings and online databases such as WebMD can falsely empower patients to pinpoint symptoms for themselves. Then, upon visiting their doctor, they feel educated on the subject and will insist on treatments that are unnecessary or even dangerous. So, how can you combat this issue? Offering live chat functionality on your website can act as the first line of defense to get any self-diagnosis issues out of the way. HelpSquad’s team of expert live chat agents can handle answering fundamental questions before a patient even walks into the office. The fear of doctors is known as iatrophobia—literally, “fear of healers.” Most people might assume that this fear is reserved for young children or perhaps those who have a fear of needles or injection. This couldn’t be further from the truth, however. A survey published in the National Center for Biotechnology Information found that 26% of patients surveyed had anxiety before going in for surgery. While pre-operation jitters are not something that most people have to deal with on a daily basis, it gives you a good indication of how some patients might view interaction with a doctor. If a patient feels anxious or during a doctor’s visit, they might feel uneasy disclosing all information, and this can put their health in jeopardy. The best solution to this problem is communication. If a patient feels comfortable and informed on the process, it might ease some of their worries. This is where implementing live chat can come in handy. Before a patient comes in, they can have all of their questions answered so they can know what to expect. This will aid in reassuring them that everything will be fine when they come in for their visit. On the other end of the anxiety spectrum is the hypochondriac. Everyone knows that one person who is confident that they are on the edge of death. Any twinge or pang sends them into a spiral of worry and panic, quickly turning to their old, trustworthy friend WebMD to corroborate the deepest, darkest outcome from the ailment. As a doctor, you can intervene on a hypochondriac’s slippery slope of concern with live chat. Live chat can be there for people who feel they must have an answer to their “dire” medical concerns quickly and easily. If there is no talking them down from their frantic, you can then use live chat to set up an appointment for them conveniently. Problem patients are an ever-present concern for doctors. Not only do they slow down the process of your practice, but they can also be endangering themselves, too. By going with a live chat platform like HelpSquad, you are enabling both you and the patient to be proactive in scheduling and dissemination of information to ensure your business runs as smoothly and efficiently as possible.